President Donald Trump announced his eighteenth wave of judicial nominees Wednesday night, just four days after the Senate confirmed Justice Brett Kavanaugh to the U.S. Supreme Court. Wednesday’s nominees include two candidates for the 2nd U.S. Circuit Court of Appeals and three for the 9th U.S. Circuit Court of Appeals. The 2nd Circuit is based in New York City and has jurisdiction over New York, Connecticut and Vermont. The 9th Circuit is based in San Francisco, and hears appeals arising from nine western states as well as the outlying Pacific territories...Trump has struggled to secure confirmations to both courts...The package also includes eight nominees for trial courts in California, Nebraska, New York, Ohio and Tennessee. The Senate may move on further judicial confirmations before the November elections. The Senate Judiciary Committee is poised to forward nine nominations to the full Senate for final confirmation on Thursday, and a confirmation hearing for lower court nominees is scheduled for Oct. 17. Senate Majority Leader Mitch McConnell will seek terms with Democrats to confirm a package of judges before the chamber adjourns for the midterms. 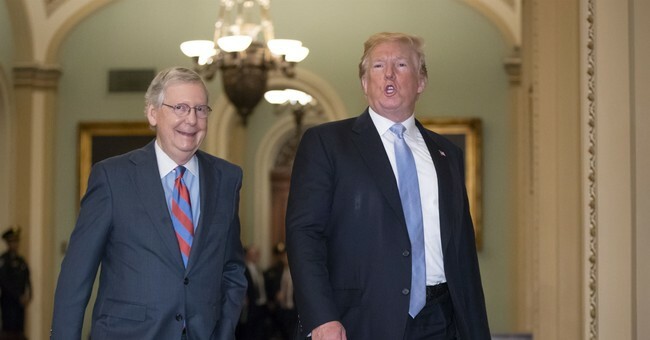 On Thursday, McConnell is expected to begin setting up votes on judges and executive branch nominees for next week, according to two GOP sources familiar with the leader's plans. And by calling up the judicial nominations now, McConnell will force Democrats to swallow more confirmations before their imperiled incumbents can leave Washington to campaign...[Democrats are] settling for a middle ground, with few committing to a full-on fight...Another Democratic senator said that "I think we will” take a deal on judges. “I think probably next week.” The Senate currently has 42 judicial nominees in the queue for floor votes, with nine more slated for Thursday consideration by the Judiciary panel. While it's unclear how many of those picks McConnell plans to seek a pre-election deal on with Schumer, the Kentucky Republican has underscored that he intends to follow his victory on Kavanaugh with more judicial confirmations before the midterms.